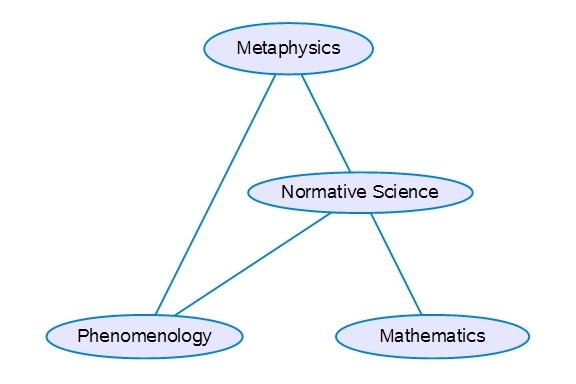 metaphysics on phenomenology and on normative science. There is more discussion of the figure and its legend here. The picture reminds us of both the analogy and the disparity between phenomenology and mathematics, between our observation of actual appearances in phenomenology and our observation of possible existence in mathematics, with “possible” in this case meaning no more than not inconsistent. The disparity is something we come to know as the fallibility, partiality, or subjectivity of all our models, representations, and theories of reality. The most astute physicists appreciate the significance of this disparity or gap, and there is a famous quip by Einstein that testifies to it, but more often than not they tend to get by like the rest of us, with a variety of naive realism. In contrast, doing mathematics requires a more constant awareness of the distance between the two footings, the terra firma of actuality and Plato’s heaven of possibilities. This means that the standpoint known as “modal realism” is really the modus operandi or standard operating philosophy within the realm of mathematics, so taken for granted that its marching orders need no banners or fanfare in the ordinary course of work. Being one who sees more continuity of development than radical reconstruction in Peirce’s thought over his lifetime, what I do see changing through the years is the greater diversity of his audiences as the river of his work flows from its constant sources to the alluvial delta he left later generations to sift. The greatest share of emphatic variance in what he writes is explained more by variations in whom he addresses than what he is trying to communicate. Drawing the conclusion for the present case, my initial guess would be that any apparent conversion to modal realism is more likely explained by an increasing need to underscore attitudes of mind that are simply tacit in the scientific application of formal logic, mathematics, probability, and statistics. This entry was posted in Aristotle, C.S. Peirce, Coherence, Concordance, Congruence, Consensus, Convergence, Correspondence, Dewey, Fixation of Belief, Information, Inquiry, John Dewey, Kant, Logic, Logic of Science, Method, Peirce, Philosophy, Pragmatic Maxim, Pragmatism, Semiotics, Sign Relations, Triadic Relations, Truth, Truth Theory, William James and tagged Aristotle, C.S. Peirce, Coherence, Concordance, Congruence, Consensus, Convergence, Correspondence, Dewey, Fixation of Belief, Information, Inquiry, John Dewey, Kant, Logic, Logic of Science, Method, Peirce, Philosophy, Pragmatic Maxim, Pragmatism, Semiotics, Sign Relations, Triadic Relations, Truth, Truth Theory, William James. Bookmark the permalink.